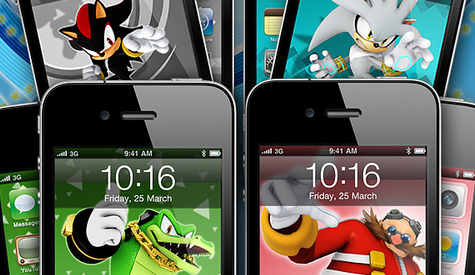 That’s right boys and girls, the Sonic the Hedgehog Skins app is on its way courtesy of Sega! Giving you access to over forty, that’s right, forty 100% original ‘Home’ and ‘Lock’ screens for your Apple iPod or iPhone. Heads will turn as you strut down the street with your selected Sonic series character shining up from your iPhone including fan favourites Amy Rose, Rouge the Bat and Silver the Hedgehog. If this isn’t enough to already have you salivating down your shirt, Sega have left us with the promise of even more custom screens being available in the near future. You won’t find these official Sonic skins anywhere else, and due to NA exclusivity, those living outside North America won’t find them at all! A price hasn’t been listed as of yet, but keep an eye on Sega-Addicts and the Sega Blog for more info as it comes. Sonic isn’t the only Sega franchise having its 20th birthday! A lite/free version of sonic 4 episode 2 has been released on IOS. Thought you may want to know! You get two stages, one is act 1 of the game and the second is the first special stage! That’s good info DRscottnik, cheers, but do remember thatt here’s a ‘TIPS’ button at the top right of every page that you can press to shoot us a e-mail with all of your handy tips. That way we’ll get it for sure, and it won’t get lost in each news post.